Yet in that confidence of a God who has always been, there is also a rush of emotions, a streaming consciousness of thoughts, words of danger. Fear. So… what is this? Is this a psalm of confidence? Or, is it a complaint? Whatever “this” is, this is the human reality, that full range of emotions. How often do our lives feel like that? Emotions, events, relationships, pulling our thoughts, our psyche, our souls, this way and that. Our rootedness in God, strong one moment… and then suddenly not so much. We like to think we have knowledge, the tools, the “all that we need”, to find our way in the world, yet “stuff” happens that rips us apart, leading us into something… a something beyond that through which we can grasp the way in to go. To be. And then Jesus shows up. Jesus arrives on the scene encouraging us to see things differently. To do things… differently. A gathering in of all that we are, who we are, how we are, the full human center of faith and being into a unifying cosmic embrace: “As a hen gathers her brood under her wings” (Luke 13:34b). And then there are Kindness rocks. A Lenten word. 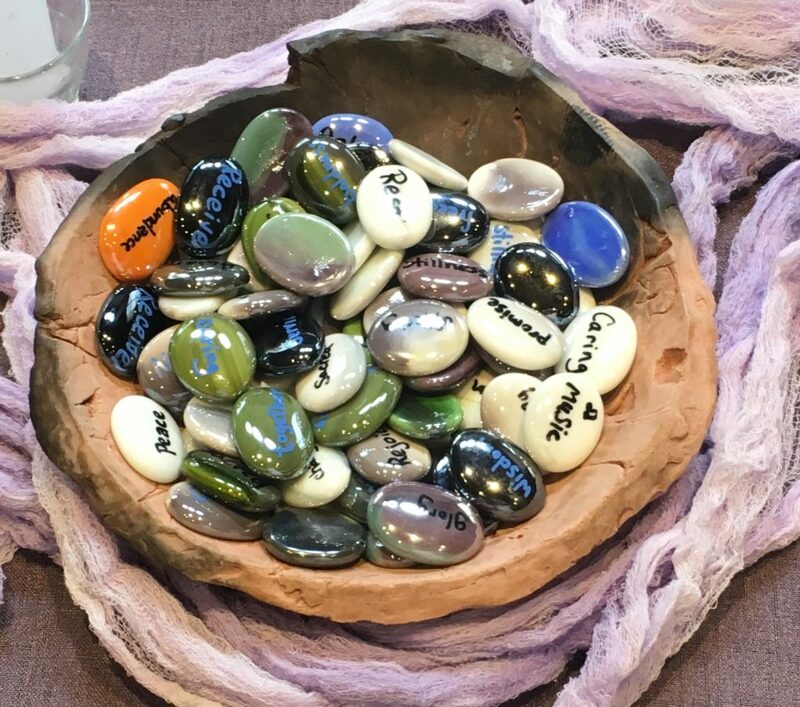 On Ash Wednesday, and the first Sunday in Lent (just last week), I invited people to take a word, a stone, a guide for this 40-day Lenten Project of refocusing ourselves on the story of Jesus. Did you pick up a word? If so, I ask you to remember your word (and if you have not yet picked up a Lenten word, you are invited to do so after worship today). How might these words, these stones, these physical reminders, help us to see things differently? To hear Jesus’ words, to respond to his way… differently? A unifying, gathering, cosmic embrace? Has your word jumped out at you at in an unexpected way this past week? Has there been a story… something that caught you off guard? A few weeks ago I shared with you that I seek such a “word” each year. 2018 my guiding word was all about “immersion,” as we at Memorial UCC began our ministry together. Steve and I also moved to Fitchburg and immersed ourselves in the community. As 2018 came to an end and I sought a new word for 2019, I prayed, I held, and I pushed back on, the word that presented itself to me: root. Root? Stand still? Remain in one place? What? As challenged as I was by the word root “finding me,” after several weeks I finally relented to the Spirit. Roots are important. Strong, healthy roots are needed to anchor, provide a good foundation, and to provide nutrients. And then the word I randomly picked out of the Lenten stones turned me inside out. Encouraged me to see things differently. For, we are learning a lot about the world around us that we did not expect. The psalm resonates on an individual level, but was sung in community. Rooted in community. Gathering. Rooted in the world around us not only as “I,” “me,” “my,” but “living in cooperative, interdependent relationships, maintained by communication and collective intelligence…” Like the trees, we are rooted together, interconnected. A world-wide web. THAT is what we are doing here. This is what we are doing throughout Lent. Families have picked up their “Lent in a bag,” people are gathering here on Wednesday nights for mindful moments and prayers, and to hear John Dominic Crossan and Joerg Rieger describe that ways in which Jesus shows us another way. Opportunities to root, gather. The loss of 50 lives, and another 50 injured. The words, “welcome brother” extended by one of the elders at the mosque to the man who would do the killings, is echoing around the world. These words of welcome contrast with the manifesto written by a person filled with hate. White nationalism. White supremacy. And like the psalmist, we pray. We pray to God in the rawness of the loss of life at the mosques in Christchurch. We pause today in the grief. The tears. We lift prayers of solidarity for our siblings who are Muslim around the world. We denounce the hate and fear that stirs division, violence, and death. Wisconsin Faith Voices for Justice, an interreligious group with which Memorial UCC partners, is hosting a year of Sacred Site Visits in the Madison area. It just so happens that I, as a faith leader, signed up for this year-long opportunity. I have been assigned to a cohort of people, of a variety of faiths. Those that have committed to this project are from faith traditions including Muslim, Conservative Judaism, Reform Judaism, Bahá’í, Unitarian, Quaker, and Christian (I am aware of people participating who are Presbyterian, Episcopalian, and UCC). We will have opportunities to worship in our various faith communities, and then meet following worship for conversation. These are spaces in which we can more fully understand our interconnectedness. The great hope of God to gather us in. Today is our first event: worshiping with the Bahá’í in community. In fact, they are worshiping now (at 10 am). While I will miss the service, immediately after our worship today, here, I will be leaving to meet my cohorts for their conversation. If you had planned on connecting with me today, I invite you to email, text, call, or message me this week (my contact information is in the bulletin). I look forward to sharing the stories from these Sacred Site Visits over the upcoming months. Beloved, there is another way. For us, it is Jesus. In the kaleidoscope of the Holy, God is more than we can imagine. May we be willing. May we see things differently. Greenberg, Pamela. The Complete Psalms: The Book of Prayer Songs in a New Translation. New York: Bloomsbury, 2010. Diàna Markosian, Richard Grant. “Do Trees Talk to Each Other?” Smithsonian.com. March 01, 2018. Accessed March 14, 2019. https://www.smithsonianmag.com/science-nature/the-whispering-trees-180968084/. “Commentary on Luke 13:31-35 by David Schnasa Jacobsen.” Luke 13:31-35 Commentary by David Schnasa Jacobsen – Working Preacher – Preaching This Week (RCL). Accessed March 14, 2019. https://www.workingpreacher.org/preaching.aspx?commentary_id=3990.